Rest in Green Meadows: It's Because of You! 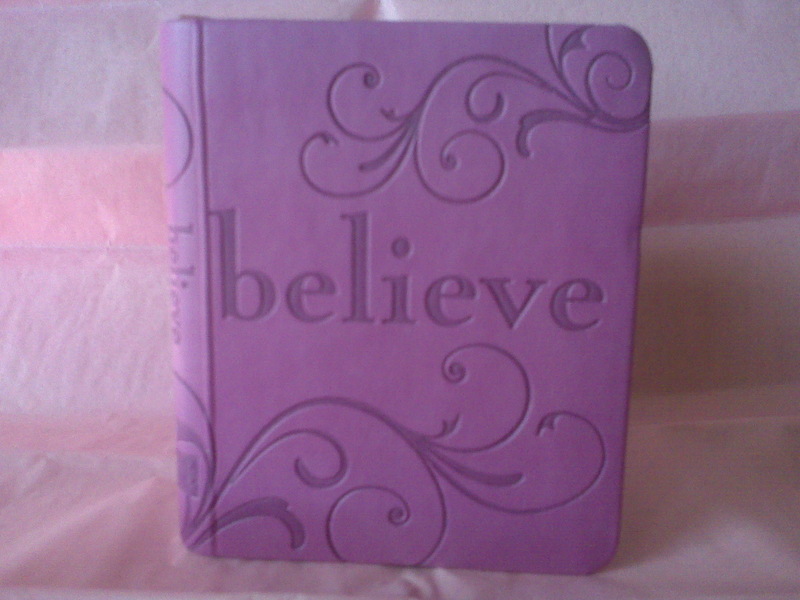 A high school friend gave me this adorable purple book with the encryption "Believe" on the front cover. 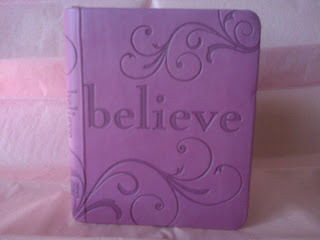 This is a book of inspirational quotes and one many are familiar with by Mother Teresa. There's another quote by Bruce Barton. "Nothing splendid has ever been achieved except by those who dared believe that something inside of them was superior to circumstance." Going into my treatment last week I knew that my mind would be tested. I would lie alone in a room, while in pain and discomfort, and battle many emotions, thoughts, ideas. I know the verse in 1 Cor 10:13 that says God will give me what I need to endure anything that tempts me. In this case God would need to give me control of my mind so that Satan could not make it his playground. I don't know if you've ever been alone with your thoughts during a difficult time and realized how Satan can play with our minds to infiltrate doubt, worry, fear, discontentment, self pity, etc. Usually when this has happened to me I've been able to get up and go play with the kids, work on a project, piddle in my garden.....anything to get my mind busy on something else. This was not the circumstance where I could run away. I had to depend on the foundation of my faith and the belief that this faith was superior to my circumstance. It was a circumstance that God did not save me from; He allowed me to face it for whatever reason. Right before my treatment began, at about 2 pm a week ago Tuesday my husband and sister, Amy, kissed and hugged me good-bye. As I watched them walk away I thought I might not be able to breath. They were both so upset and I knew it was harder on them than I. They had to walk away and go on with normal life as they pictured me there. I put on my brave face as the doctor explained how she was activating my internal radiation. My husband drove to his parents house to care for our children. Amy made the 3 1/2 hour trek home where she posted on my blog the details of Day 1 and put out a prayer challenge. As I checked my phone I didn't realize this prayer challenge was in place, but I continued to get e-mails from people committed to pray for me and sending encouraging words my way. All through the first night I read over these verses, words, commitments. At 4:00 am my mom texted, saying "we're up, if you want to call". I called right away and mom told me about the prayer challenge on my blog. I watched your words roll in over the next two days via my blog comments and facebook and I know that my faith was strengthened to endure the 47 hours of treatment. My spirits were lifted so I could smile and visit with the nurses and doctors that stopped in occasionally. My hope was restored and renewed as I kept my mind focused on our Savior and His work through you. It's because of you and your prayers that this treatment was easier than I expected. If I could repay you I would, but for now all I have is a very humble and heartfelt...thank you! You are such an ISPIRATION! Jesus surely is shining through you! This will be the third time I will try to post to your blog. Every time the power goes out. I just want you to know what an encouragement you are to everyone!!!! You have a beautiful spirit. I think you are repaying everyone by living your faith. Please know that you are being prayed for every morning noon and night and in-between. Every time we here the call to prayer here in Prishtina we automatically pray for you. Blessings to you!!! Melba & Mike! !